Hi everyone and welcome to my contribution to this week’s WIPpet Wednesday. Today I’m running late with it cos I’ve had a lot on, but I’m here now and looking forward to reading your excerpts as well as reading your comments on mine! Today I’m sharing 29 words from my current WIP ‘Reunion’. So it’s 31-2=29 because it’s 2013. Get it??!! Not great maths I know but I’m bending the rules cos it’s a good couple of sentences. At this point in the story, my MC Anna is recalling her parents’ messy break up. Looking forward to your comments. It all came back to her. She recalled the terrible arguments between her parents, the shouting, the slamming of doors, the kitchen utensils and other inanimate objects clashing unnecessarily. So that’s it. 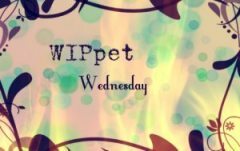 If you would like to join in the WIPpet Wednesday fun, just post an excerpt of whatever your working on writing-wise on your blog. The only rule is that the length of the excerpt has to correlate to the date, so it could be 31 lines from chapter 7. You can get creative. Then add your name to this linky. Thanks always goes to K.L. Schwengel for hosting. What a lousy memory. All too common, I gather, but it stinks. I hope Anna doesn’t blame herself. Oh good – glad I’m not that late lol. Also wow – you start early!! I’m impressed. 🙂 Anna doesn’t really blame herself as such for what happened with her parents, but their breakup is painful for her to remember. I had to take my husband to work that morning, and he had to be there at 6. Otherwise, I wouldn’t have started until 8 or later. Ah I see. Well I’m glad for you that you don’t have to start off that early usually! I don’t do early mornings very well. My peak time of alertness is about 11 am to 1 pm, but that can vary! Daylight’s always good. So you don’t do early mornings either? Guess not many people do. That’s a heartbreaking memory to have and seems like it still really hurts her years later. Hi Kate. Yes it does hurt her still. I think there’s an element of her fearing to trust people in relationships she has even now because of it. Wow. A sad memory, and one to which I can relate. I’m sorry to hear it’s one you can relate to L. Marie. I’m blessed in that my parents are still together after all these years. That doesn’t mean that they haven’t had their moments though. That is a sad memory to dredge up. Powerful 29 words. Thanks Kathi. Yes it is a sad memory for Anna. Her parents’ break up affects her even now. I think something like that happening when you’re a teenager can be a really big blow. There is something almost pedantic about the “other inanimate objects clashing unnecessarily”, as if she was looking back on the experience and thinking her parents were acting childish. I like it. Thanks Eden. I hadn’t quite thought of it like that, but yes I guess in a way they are acting childishly. Certainly their anger towards each other is coming out through the banging of things, though fortunately they’re not taking their anger out on each other physically. It’s just the choice of words you used like “unnecessarily”. That stood out and made it seem like Anna saw their actions as childish. Having seen my parents throwing and breaking things in fits of pique with each other, my perception, I’m sure is somewhat flawed. I love the phrase “clashing unnecessarily”. It really gives a sense of how hurtful it felt for Anna at the time. Glad you like it Emily. What happened certainly was hurtful for Anna and her sister (who, by the way, is called Emily!!) and it’s taken them a long time to come to terms with it. I liked the use of “unnecessarily.” Very powerful word in this instance. Thanks Gloria. Glad it comes across that way – it’s meant to! It was a very tough time for my character, and she’s never really quite come to terms with it.